This is a tremendous tribute that the Imam of age made Hazrat Maulana Nur ud Din’s example a benchmark for his followers. The verse says: How good it would be if each person of the community became Nur ud Din signifying that is everyone became like him a revolutionary change could be brought about. Hazrat Musleh Maud (may Allah be pleased with him) has narrated some accounts of Hazrat Maulana Nur ud Din (may Allah be pleased with him) which illustrate the deep reciprocal love between the spiritual master and the follower and also the profound humility and sincerity of the follower. Once on his visit to Qadian, Hazrat Maulana Nur ud Din (may Allah be pleased with him) was told by the Promised Messiah (on whom be peace) that he had received a revelation about him that if he returned to his hometown he would lose this respect. Hazrat Maulana Nur ud Din (may Allah be pleased with him) was having a magnificent house built back home at the time with a splendid hall which was to be used for giving Qur’an lessons and also as his clinic. Hazrat Maulana Nur ud Din (may Allah be pleased with him) did not ever return to his hometown even to look at the house and said that he had left it for the sake of God and there was no need to see it. At the time some individuals thought very highly of their own intellect and were getting inclined towards worldliness. Generally speaking the opinion of Hazrat Maulana Nur ud Din (may Allah be pleased with him) and Hazrat Musleh Maud (may Allah be pleased with him) would be the same, while those with airs and graces held different views. At one time future of Taleemul Islam School was under discussion. Some wanted it closed because they opined the Jama’at could not afford to run two schools and wanted to only retain it as a Madrassa for Arabic language. Hazrat Musleh Maud, a minor at the time, was very against this and Hazrat Maulana Nur ud Din shared this view. Hazrat Musleh Maud says he was passionately zealot about this matter and because Hazrat Maulana Nur ud Din Sahib did not want to make his case in front of the Promised Messiah (on whom be peace) owing to the respect he had for him, he used to utilise the young Hazrat Musleh Maud to pass on his messages. Ultimately these one and a half twosome (half because one was still a minor) triumphed when the Promised Messiah (on whom be peace) decided in their favour. From the beginning when the Promised Messiah (on whom be peace) made his claim people who served in excellent ways followed him. One of these people was of course Hazrat Maulana Nur ud Din (may Allah be pleased with him). He had of course started reading the Promised Messiah’s (on whom be peace) books before he had made his claim. When the Promised Messiah claimed to be the Messiah, he wrote about the subject in his books ‘Fateh Islam’ and ‘Tauzeeh Maram’. While these books were still being published some ill-thinking individual saw their proofs and wanted to turn Hazrat Maulana Nur ud Din, who had taken bai’at, against the Promised Messiah (on whom be peace). Reading about prophethood in these books he thought that Maulana Nur ud Din would definitely leave the Promised Messiah (on whom be peace). He took along a party of men to see Maulana Nur ud Din and asked him what would he do if he heard that someone had claimed that he had been sent as a Prophet in this age and that a Prophet of God could come after the Holy Prophet (peace and blessings of Allah be on him) from among the Ummah. Hazrat Mualana Nur ud Din replied it depended on who had made the claim. If the person was not truthful he would be considered a liar but if he was truthful then Maulana Nur ud Din said he would think he was the one mistaken because a Prophet could still come. The individual said Hazrat Maulana Nur ud Din had lost his way and told him what his ‘Mirza Sahib’ had written to which Maulana Nur ud Din replied, no doubt whatever Mirza Sahib has written is the truth, I have faith in him. A sister of Hazrat Maulana Nur ud Din (may Allah be pleased with him) was a disciple of a Pir but she came to Qadian and took bai’at of the Promised Messiah (on whom be peace). On her return her Pir queried her about the bai’at and remarked that ‘Nur ud Din had cast a spell on her’. When she narrated this to Hazrat Nur ud Din (may Allah be pleased with him) he advised his sister that if she ever bumped into the Pir she should tell him that he was responsible for what he practiced and she was responsible for what she practiced and she had accepted the Promised Messiah to avoid chastisement on the Day of Judgement. The Pir’s response to this was: do not worry, on the Day of Judgement I shall carry your sins and you can go to Paradise. She asked what will become of you? He replied I will glare at the angels and say to them, was the sacrifice of our forefather Imam Hussain Hassan not enough that now we are being frightened? Hazrat Musleh Maud (may Allah be pleased with him) writes that once the Promised Messiah (on whom be peace) said to Hazrat Mualana Nur ud Din that one way of expanding our community was to have many children and for this purpose more than one marriage should be undertaken. Hazrat Mualana Nur ud Din most humbly said he was ready to obey the instruction but who would wed their daughter to him at his age. This made the Promised Messiah (on whom be peace) laugh. Although some sons of Hazrat Maulana Nur ud Din Sahib held wrong stance about Khilafat and the Jama’at, owing to Maulana’s great love for the Promised Messiah (on whom be peace) he is remembered in prayers, he accepted the Promised Messiah (on whom be peace) when the whole world was against him. Hazrat Musleh Maud (may Allah be pleased with him) said that when the Promised Messiah was looking for matrimonial matches for him and his brother Hazrat Mirza Bashir Ahmad he would first ask how many children were there in the family and how many brothers did the father have. When looking for Hazrat Mirza Bashir Ahmad he asked the same question and when he was told that they have seven sons he gave this fact the foremost consideration and said the marriage should be arranged there. Hazrat Khalifatul Masih added that these days a lot of stress in given in certain places to family planning and now some countries realise that their stance was wrong. Certainly problems arise when one tries to go contrary to laws of nature. Couples were fined in China is they breached the law restricting them to just one child. This resulted in many abortions and indeed infanticides. China has now lifted the restriction. It is also being realised wherever else such restrictions are in place that this will result in shortage of manpower and they are changing their policies. Hazrat Musleh Maud (may Allah be pleased with him) said that in the early days many different chores needed to be done in Qadian, like cooking, getting groceries etc. and these chores could not be carried out only by the family of the Promised Messiah. Many others used to help out. For example when a delivery of fuel came, it needed to be stored away. So, a female attendant who took delivery would call out, is anyone here to help put the fuel in the store. A few people would come forward and do the chore. Sometimes, no one responded. Once a despatch of cow dung (fuel) came, the female attendant called out but no one answered. Just then Hazrat Maulana Nur ud Din (may Allah be pleased with him) was returning after giving a lesson of the Holy Qur’an. Due to his knowledge and skill as a physician he had great status in the Jama’at. The female attendant again called out, ‘it is about the rain, please can someone come and put the cow dung away’. Hazrat Mualana Nur ud Din saw this and said, well, today we will become that someone and he proceeded to do the chore. He was a mentor, seeing him many who were his students joined in. Hazrat Musleh Maud (may Allah be pleased with him) says he had seen Hazrat Mualana Nur ud Din (may Allah be pleased with him) helping in this manner two or three times. It was the habit of Hazrat Maulana Nur ud Din Sahib that when he was very happy, and owing to his great love for him, he would refer to the Promised Messiah (on whom be peace) as ‘our Mirza’. He knew the Promised Messiah long before he made his claim and was used to this term of endearment from earlier times. Some foolish people criticised that, God forbid, Maulana Sahib did not duly respect the Promised Messiah (on whom be peace). Hazrat Maulana Nur ud Din’s response to this was; some people criticise that I do not respect the Promised Messiah (on whom be peace) although I use this term for him owing to the intensity of my love for him. Once the Promised Messiah (on whom be peace) was in Delhi when Mir Nasir Nawab Sahib fell severely ill. Doctors suggested surgery while some advised to use Unani (Perso-Arabic) medicine. The Promised Messiah sent a telegram to Hazrat Maulana Nur ud Din to come promptly in whatever state he was. Hazrat Maulana Nur ud Din was at his clinic at the time and did not even have his coat. He took someone with him and set off immediately. When his companion suggested he went and got some money Maulana replied, no, the instruction is to come in whatever state we are. They walked to the town of Batala (11 miles) and reached the railway station. The companion asked how were they going to meet the fare and Maulana replied let us sit here, God will arrange it. Meanwhile a man came to them and asked if he was Hakeem Nur ud Din. When he said yes, the man said there was some time before their train departure, and he had asked the station master to wait for them anyway. He said his wife was very ill, could Maulana go and treat her. Hazrat Maulana Nur ud Din went and saw the patient, wrote a prescription and returned to the station. In gratitude the man bought their tickets and offered Rupee 50 thus Hazrat Maulana Nur ud Din reached Delhi and treated Mir Nasir Sahib. Hazrat Musleh Maud writes (may Allah be pleased with him) that this is a great example of trust in God. However, one is also tested at times, at times one has to endure starvation and even lose clothes off one’s back, or be at the brink of death so that people may know that God’s servants completely rely on Him and trust Him. Hazrat Maulana Nur ud Din (may Allah be pleased with him) indeed had great status and the Promised Messiah (on whom be peace) acknowledged it in his Persian verse: چہ خوش بودے اگر ہر یک زامت نور دیں بودے . However, exaggeration and hyperbole should always be avoided. Some children of Hazrat Maulana Nur ud Din tried to overstate his status as did some others, who rejected Khilafat, and who had vested interests. Hazrat Musleh Maud (may Allah be pleased with him) said that no doubt one should always say what is true. The Promised Messiah (on whom be peace) elevated the status of Hazrat Maulana Nur ud Din and no doubt the Holy Prophet (peace and blessings of Allah be on him) highly praised Hazrat Abu Bakr (may Allah be pleased with him). However, the Holy Qur’an was not revealed to establish the honour of Hazrat Abu Bakr (may Allah be pleased with him) and nowhere in a revelation of the Promised Messiah (on whom be peace) was it said that the honour of Hazrat Maulana Nur ud Din be established. Indeed, what was factual and true was expressed. It is ungrateful not to mention someone’s sacrifice. Hazrat Musleh Maud says he remembers once a person told the Promised Messiah (on whom be peace) that Maulana Nur ud Din Sahib’s treatment had been very beneficial to him. The Promised Messiah (on whom be peace) was not feeling well on the day but he sat up and said to Hazrat Amaan Jan (may Allah be pleased with him) that God had inspired Maulana Nur ud Din to come to Qadian and so many people were availing of him. His presence was a great favour of God. Once a companion came to see the Promised Messiah (on whom be peace) in Qadian and went to Masjid Mubarak. Shoes were placed by the door of the mosque. A person in simple clothes came and sat just by the shoes. This companion took the man to be a habitual thief who stole shoes, so he kept a watchful eye on him. After the Promised Messiah (on whom be peace) passed away and the companion heard that someone had become Khalifatul Masih, he came to take bai’at. 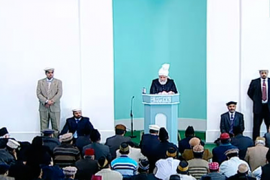 When he extended his hand to take bai’at, he saw the very same person whom he had thought to be someone who stole shoes, that is, Hazrat Khalifatul Masih I (may Allah be pleased with him). The companion was mortified. It was indeed the habit of Hazrat Maulana Nur ud Din (may Allah be pleased with him) to sit where shoes were kept and would only move forward when the Promised Messiah (on whom be peace) called him. He attained his high status through these acts of humility. Thus was the humility of someone who excelled in spiritual knowledge and was among the top most physicians of India and who was greatly honoured by the Promised Messiah (on whom be peace) and this only increased his humility. May God continue to elevate his station and give sense to those who create mischief in his name and may God enable us to draw lessons from his model according to the wishes of the Promised Messiah (on whom be peace). Today Jalsa Salana of Maurituis begins. They are celebrating their centenary. May their Jalsa be blessed in every way and may the past one hundred years herald new progress. May the Jamaat there make many new plans! There are some troublemakers in Mauritius, may God protect from them and may He bless the Jalsa and its programmes in every way.